Every pastor and church struggles to find missionaries who are the right fit for their church. They search for missionaries with the right philosophy, who are going to the places which match their church's missions philosophy, and for those who will extend their church's reach of the Gospel. Thank you for facing these challenges and leading your church to invest in the Great Commission. 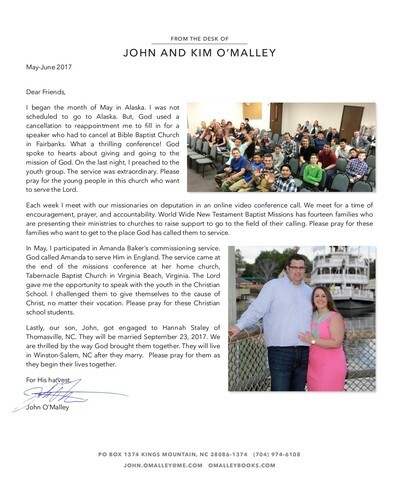 Thank you for supporting Kim and me in the work God called us. 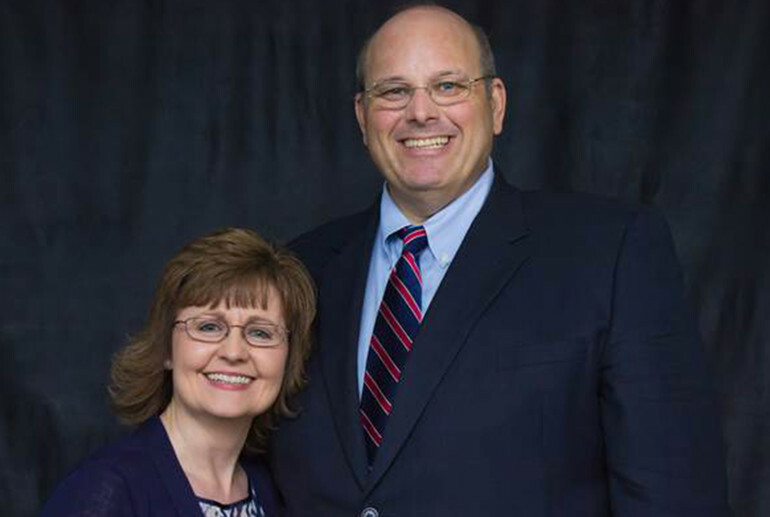 Kim and I are grateful for your support because, without you, we could not preach the Gospel to the lost. Without your investment, we could not assist missionaries on the field. Without your partnership, we could not help churches build their missions programs. Without your participation, we could not serve newly-started missionaries in taking their first steps in ministry. Without your prayer, we could not guide prospective missionaries in getting from their calling to the field. We need you. We are thankful for you. We pray for you. 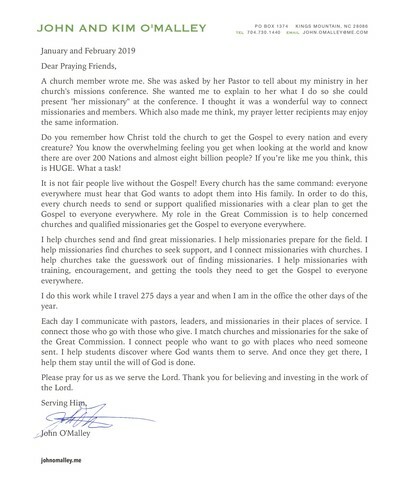 In January, I participated in a missionary's commissioning service. I met this missionary during his college training. Many of you prayed when I took him on his survey trip to the Solomon Islands. Today, he is serving there with his wife and son. 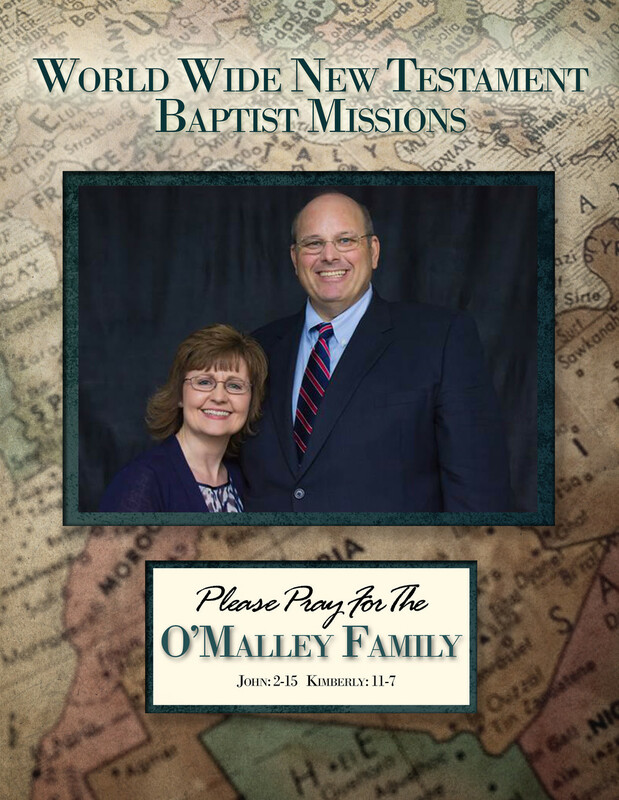 Pray for this family; they are the Deatricks with World Wide New Testament Baptist Missions. In January, I met with a prospective missionary about service in a rural mountain area in Peru. Her village is a 24-hour bus ride from Lima. She is seeking direction about a missions agency to help her church send her to the field. In January and by the end of February, I will have spoken in four churches to help build their Great Commission program by investing and being involved in delivering the Gospel. Your giving helps us go. Your praying makes us useful. Your friendship sustains us. God's mission to redeem the world defines our daily tasks and life's work. Your investment makes us available to present the Gospel. You help us assist churches and missionaries with their Great Commission work. We appreciate you enabling us to fulfill the call of God. Last month, God used your investments to allow me to be on the campus of Ambassador Baptist college. 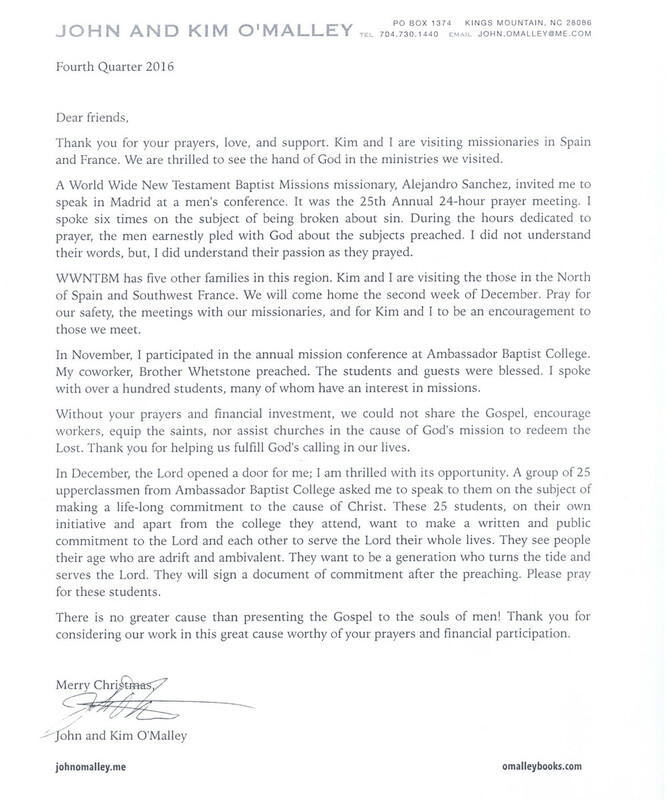 Each Fall the college holds a missions conference. Their conference is about exposing students to missionary opportunities and mission agencies. During the conference, I spoke with more than 100 students. The Lord allowed me the opportunity to speak in classes to encourage students to serve the Lord. Thank you for making that opportunity possible. During November and December, I assisted eight churches with their Great Commission efforts. A missions conference is an opportunity to keep the mission of God before God's people. The conference allows people to renew their commitment to give toward God's mission. Thank you for investing in the Great Commission efforts of your church. 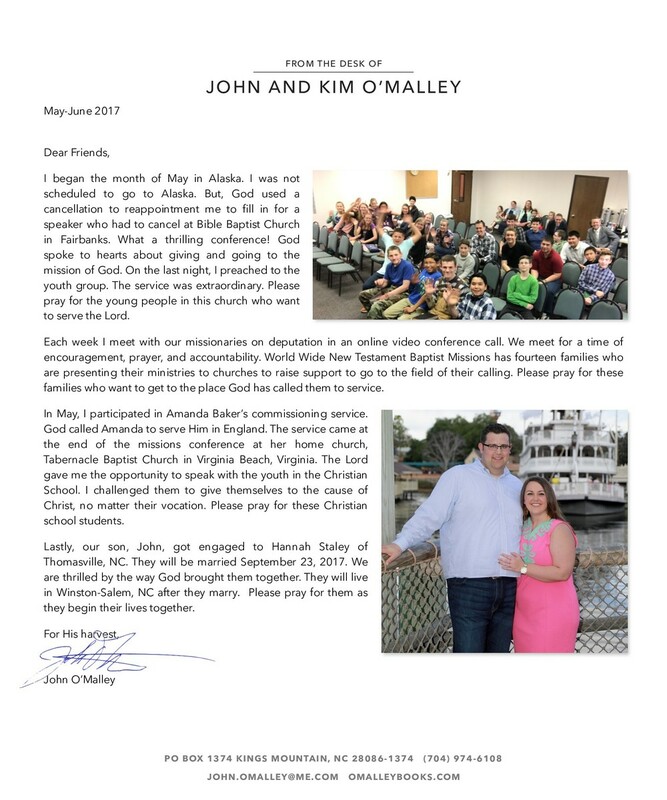 The Lord gave me the opportunity to be a part of two new missionary interviews. The interview is the last step in vetting new missionaries for our agency. These new missionaries will be going to Brazil and the Dominican Republic. Thank you for making it possible to help the world get new missionaries. Kim and I wish you the brightest and the most joyous celebration of our Savior's birth. Thank you for what you do to help us bring the Gospel to a world who knows nothing about redemption or adoption. 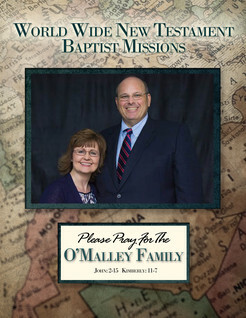 Thank you for supporting us to help in the work of the Great Commission. churches, and advance the Gospel. We could not do this task without you. Thank you. This quarter, the Lord allowed me to assist nine churches in their mission conferences. God’s Word, and look for a place in the world to be used on the mission of God. help your people, let me know, and I can help you order them in bulk. 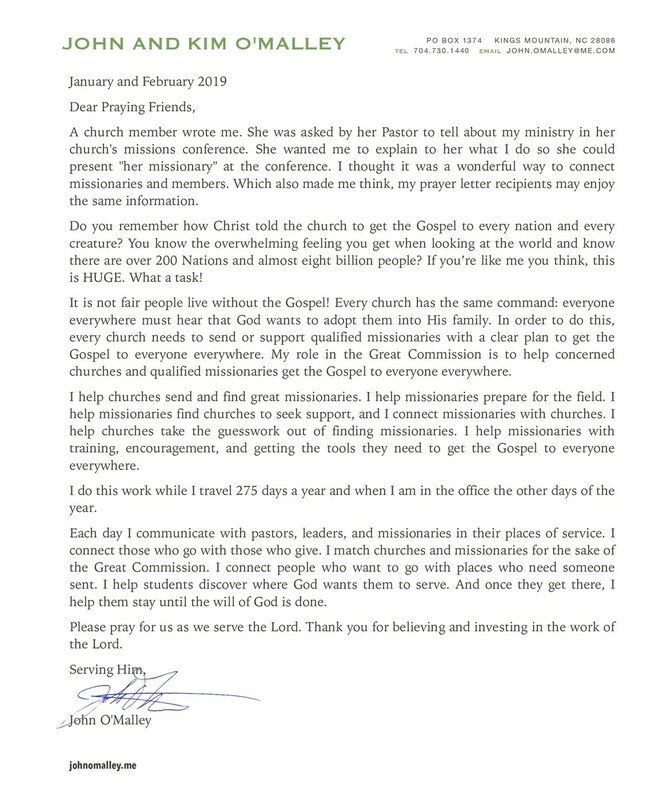 Thank you for making this ministry possible!